Soon afterward Jesus went with his disciples to the village of Nain, and a large crowd followed him. A funeral procession was coming out as he approached the village gate. The young man who had died was a widow's only son, and a large crowd from the village was with her. When the Lord saw her, his heart overflowed with compassion. "Don't cry!" he said. Jesus' heart went out to this woman who was left all alone. While many mourned with her, Jesus longed to comfort her. His heart was full of compassion. He could say what no one else could say: "Don't cry!" Most of us can only cry with those who have lost loved ones. 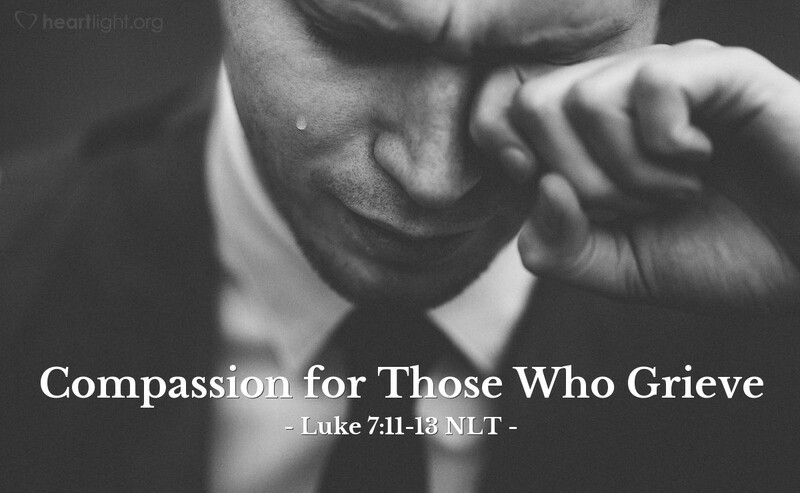 Only Jesus can wipe away our tears. Jesus is touched by our loss and by our mortal limitations. That's why he came to earth. We can be assured that he feels our losses in the same way. When we cry in grief, we do not cry alone. Father, thank you for sending Jesus to be the answer to our sentence of death. I am profoundly touched by his empathy and concern for those who have lost loved ones. Use me to bless those touched by death and to share your grace. In Jesus' name. Amen.